The TOSketchfest Film Festival Line-Up Announced! We’re kicking off our 2019 festival with a smaller festival! It’s our third annual TOsketchfest Film Fest, presented by Church + State. We’re so proud to bring the best sketch comedy filmmakers from Toronto, and around the world, together on screen. It’s one thing to see these hilarious shorts while sitting at your computer, or let’s be honest, watching them on your phone in the bathroom. It’s another thing entirely to watch them with a packed audience on the big screen, all reacting and enjoying every moment together! Please join us in celebrating the hard work of our incredible video creators. We had a record number of submissions this year, and our dedicated jury of comedy professionals painstakingly viewed and evaluated every submission. At the end of the screening, a select number of finalists will be chosen to have their films presented before every show at The Theatre Centre for the duration of the Festival. One finalist film will be crowned “Outstanding Comedy Short” at our Best of the Fest Showcase on Sunday, March 17. The winner will receive a $2000 media spend, and a professional marketing consultation from Church + State, valued at $10,000. 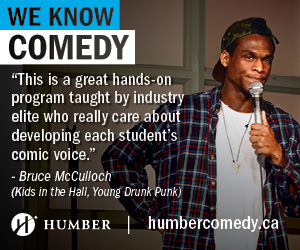 The goal of the Toronto Sketch Comedy Festival is to help our artists succeed, and a serious media strategy is one way to help content go viral and develop skills that will help them in the future. We want to thank Church + State for their continued support of our organization, our artists and the comedy community. See you on the blue shag carpet!